A long overdue study that draws on previous German writing to analyze how the West can or should (or should not) cope with the problem of small wars in lesser countries in which we nevertheless hold a stake . . . In recent years the great powers of the West—primarily the US and UK—have most often been relegated to fighting "small wars,” rather than the great confrontational battles for which they once prepared. It has been a difficult process, with some conflicts increasingly being seen as unwinnable, or at least not worth the effort in treasure and blood, even as the geopolitical structure of the world appears to slip. It is thus worth paying heed now, to the experiences of another power which once encountered the same problems. This work examines the German analysis to the problem, covering their experiences from the Napoleonic era to the Third Reich. Though the latter regime, the most despicable in history, needed to be destroyed by US/UK conventional force, as well as that of the Soviets, the German military meantime provided analysis to the question of grassroots—as opposed to great-power—warfare. This work is built around the historical analysis titled Kleinkrieg, provided to the German High Command by Arthur Earhardt in 1935 (republished in 1942 and 1943) which examined insurgencies from French-occupied Spain to recurrent problems in the Balkans. It also calls upon the Bandenbekampfung (Fighting the Guerilla Bands) document provided to Germany's OKW in 1944. In both, conditions that were specific to broader military operations were separated from circumstances in occupation campaigns, and new background in the German experience in suppressing rebellion in World War II is presented. Edited and annotated, along with new analysis, by Charles D. Melson, former Chief Historian for the U.S. Marine Corps, Kleinkrieg expands our knowledge of the Western experience in coping with insurgencies. Without partaking in ideological biases, this work examines the purely military problem as seen by professionals. While small wars are not new, how they should be fought by a modern industrial nation is still a question to be answered. Rediscovered and presented in English, these German thoughts on the issue are now made available to a new generation of guerilla and irregular war fighters in the West. This work deserves to find a place on the bookshelf of any student of German military history, but especially that of anyone seeking to understand the particular issues and imperatives that have influenced the development of the German army and its doctrine for countering guerillas, partisans and irregular forces ever since 1871. 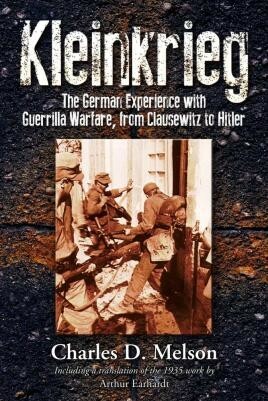 With Kleinkrieg, we get German military opinion on guerilla warfare straight from the horse's mouth. By utilising these studies, Melson ensures that he gives the most accurate and detailed analysis he can. 'Fighting the Guerilla Bands' is an excellent addition to the work seeing as it gives a full rundown of how to deal with almost any kind of partisan activity, and is complete with illustrations that stop the text from becoming dry and monotonous.